My girls love stickers and if your children are anything like mine stickers do not seem to last very long. They get stuck everywhere and then simply do not peel off and re stick. I have lost track of the number of stickers I have removed from the front door. Farm jigsaw and sticker book really appealed to my daughters. First the sticker book. The stickers can be peeled and re stuck, which means they can be re used to create lots of different pictures. Best still they have been stuck on the front door and I have managed to peel them off with ease. The jigsaw is really lovely, it has 36 pieces and they are of a decent size for a 3 year old to handle. 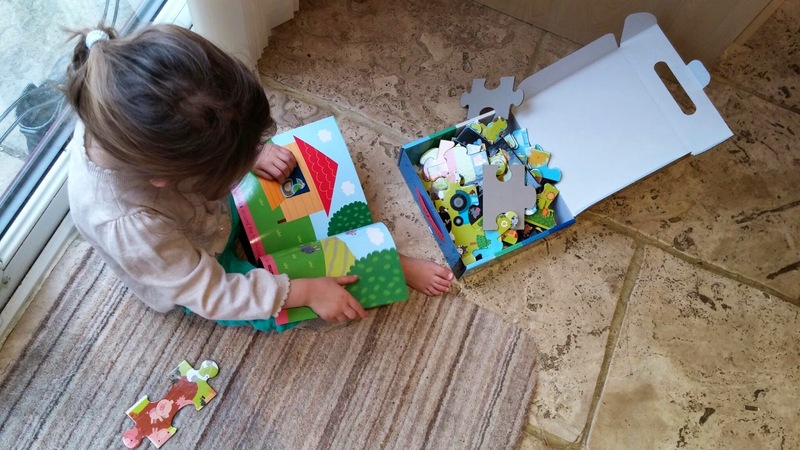 The jigsaw is bright and colourful and full of farmyard fun. Children can explore the farm naming the animals and the colours. It is a beautiful jigsaw to complete on an evening to help the girls unwind. The set from little tiger kids is priced at £8.99 and would make a beautiful gift for any child aged 3 - 5 years.